I make a trip home every month – January was an exception, where I went home every weekend. After my last trip home, I was immediately searching for tickets for my next trip. A couple of services were up on my list of “to be tried” services. 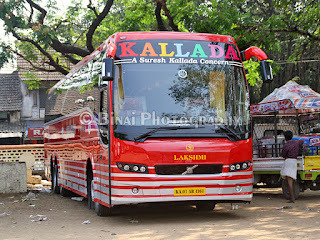 One of them was Kallada Tours & Travels’ Volvo service to Ernakulam via Kozhikode. I don’t want to reveal the others – but looks like some of them would remain on the list forever. 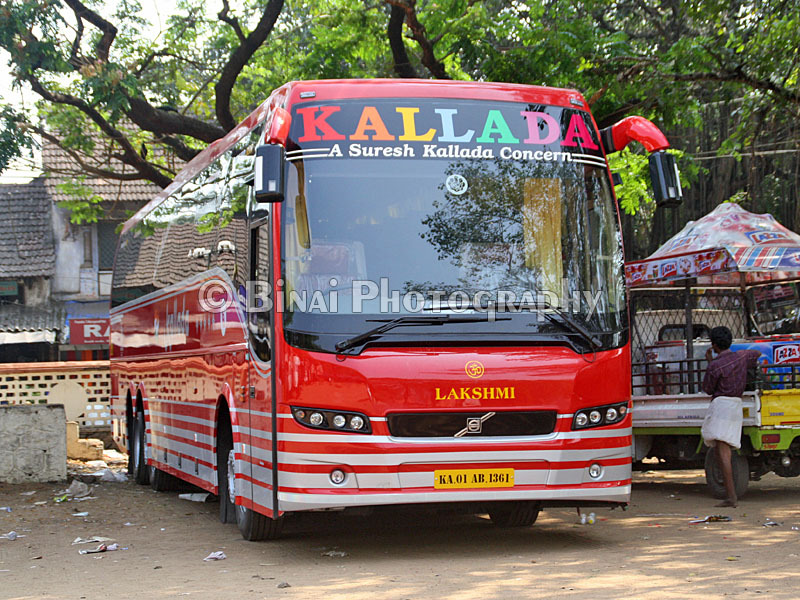 I zeroed in on the Kallada bus via Kozhikode and checked their website – but only the last row seats remained open for booking online! I was sure that the other seats were blocked – not really sold out. Headed to their office on a Sunday, and got the ticket booking through the office – interestingly, the bus was completely empty at that time – mine was the first ticket to be booked! About a week before the journey, the bus was opened for online reservation – the bus filled up in no time! It was one very busy day at office – thankfully, traffic on Bannerghatta road was light and that helped me reach home by around 1800hrs. I spent some time browsing the internet, and later packed my dinner for that night, and got ready to head out. I left home around 1900hrs, and hired a rick to head straight to the Kallada office at Madiwala Checkpost – their new office. The rick driver took a very crude road – I almost broke my back by the time the rick got on to good roads. I was dropped outside the Kallada office at around 1940hrs. I headed to the office and got my boarding pass. Chatted with the people there for some time – they were proudly showing the brochure of Scania, which was shot outside the very same office. My bus for the journey – KA-01-AB-1361 was already parked outside the office, but boarding hadn’t started. The engine was switched on around 1950hrs. The pick-up van from the old office came shortly after that – once the pick-up came, they started boarding. There were lots of people for this bus in that pick-up van. Boarding was over by around 2000hrs itself. They came around to check tickets at around 2005hrs – quite early by Kallada standards. But a few more passengers were yet to turn up – we continued our wait for them. We finally got moving at 2018hrs – three minutes late. We had about 20 passengers on board from here. Interestingly, traffic was light till we reached Minerva circle – the opposite side was jammed almost throughout, though. Beyond Minerva circle, traffic slowed down to a crawl – especially as we neared the intersection of TSP Road. 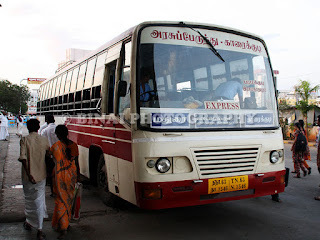 It was jammed beyond that – after a lot of crawl, we finally reached Kalasipalayam Market bus station (2049hrs). The cop standing at the beginning of Albert Victor Road would not permit the bus to enter the road – the Kallada office is on AV Road. The driver kept pleading to the cop to let us pass – but he wouldn’t accept the pleas. Finally the bus driver had no option but to take another round. The traffic along the road had increased exponentially by now. After the long round, we reached back at AV Road, in front of the Kallada office, at 2108hrs – about 23 minutes late. The bus filled up here – we had 48/48 seats as we were signalled to start from Kalasipalya. The office guy signed off the trip chart, and informed the crew that there were no pick-ups from Mysore or elsewhere. We started off at 2117hrs. It was then a painful crawl through TSP Road, to reach Sirsi Circle. Mysore road had a lot of traffic – but the traffic was moving. I remember seeing Kengeri TTMC – but dozed off even before we passed NICE road. I woke up when the cleaner announced a 10 minute break for dinner – the time was 2242hrs. I got off the bus and had a short stroll. Switched on the GPS to find the location – we were past Channapatna now. 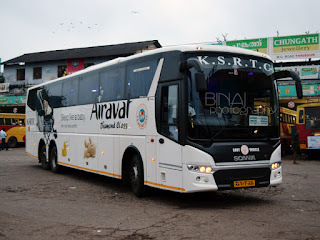 We were joined by a couple of Kannur bound private buses and a KeSRTC Super Express to Kannur. We started off after dinner at 2300hrs. I slept off soon after the bus started. I had a fairly nice sleep – woke up when the bus stopped at Hunsur for some checking – did not notice the time. I remember the bus hitting a bad patch past Hunsur, on the Gonikoppa route. I dozed off as the bus rocked hard passing through the inexistent roads. The bus did make some rattling sound at this point. I woke up when the bus stopped again – in fact, the bus was stationary when I woke up. The time was past 0247hrs then – rubbed by eyes straining to read a board a little away – the board read “Forest Check Post – Kutta”. OMG! We were already at the Kerala border!! We were still in Karnataka though. There was so issue between the crew and the people sitting in the check-post – the standoff continued for quite some time. In the meantime, the Bangalore-Kalpetta Super fast of KeSRTC overtook us and went. We started off at 0314hrs. I pulled out by spectacles now and remained alert to see how the bus handles the forest route. The roads were narrow and winding – the bus was handling all the curves brilliantly. There was narrow bridge on the way – the bridge had a perfect 90-deg approach, and the bridge was just wide enough for the bus. The driver managed to get the bus past without hitting anywhere – guess the guy was a regular on the route. The bus was stopped by the forest guys again at the exit gate – the crew had a tough time convincing the people to open the gates – the crew kept saying that the bus was full, and requested him to let the bus through so that he could drop the passengers on time. From the conversation, I understood that it was related to some money the crew had to pay to let the bus through. The conversations continued for about ten minutes. The roads were in excellent shape post Kutta – it was winding and somewhat narrow as well. We stopped at the Kerala incoming check post – but no issues, the bus was allowed through. The roads got wider as we proceeded towards Kattikulam. I remembered my drive through the route in 2011 – it’s a beautiful route all way through. We reached Kattikulam at 0340hrs – a short stop – about 5 minutes – to get the papers cleared by the RTO, and we were through. I slept soon after we passed Kattikulam. I had an undisturbed sleep all the time till the cleaner called out passengers alighting at Kalpetta. We stopped outside Kalpetta new Bus station at 0424hrs – about 5-6 passengers got off, and we got moving at 0426hrs. I dozed off again – did not even realise when we ran past Wayanad pass (Thamarassery ghat). I woke up when the bus stopped again to drop passengers – we were at Kozhikode bypass now – at Malaparamba junction (0605hrs) About 4 passengers got off and we continued our run. The bus went through Mavoor road, and stopped again outside Kozhikode mofussil bus station – 0611hrs. This was a fairly long halt – about 30 passengers got off. We started off at 0616hrs, and headed to the Kallada office on MM Ali road. We reached the office at 0618hrs – a couple more passengers got off. The crew went to get the chart signed, while some passengers took a stroll outside. I was still sleepy, and hence remained in my seat. We started off at 0625hrs. There were just 5 passengers now! One passenger each to Chelari, Kuttipuram, Triparayar, Kodungallur (yours truly) and Ernakulam (a poor passenger who mistook this bus for a direct bus) respectively were onboard now. I dozed for some more time, but woke up by the time we reached Feroke. Roads started getting crowded by now – we couldn’t do great speeds anymore. Made a brief halt at Chelari to drop a passenger (0654hrs) and got moving immediately. I loved the way the bus passed the mini-ghat section past Valanchery. The driver in good control of the bus, and he maintained fairly good speeds as well. We stopped at Kuttipuram to drop a passenger (0749hrs). Beyond Kuttipuram, we entered one of the best roads in Kerala – the well maintained Kuttipuram-Perumbilavu State highway. The driver hit three digit speeds on a couple of occasions in this section. We passed Kunnamkulam at around 0810hrs, and Guruvayur around 0840hrs. I was enjoying the ride in a multi-axle bus on a route that I’ve frequent umpteen times in my car. I loved the way this bus passed through the narrow roads. We reached Thriprayar around 0905hrs – a passenger got off here. I called up home and arranged a pick-up from Kodungallur. The ever familiar places along the route – Valapad, Chentrapinni, Moonnupeedika, Perinjanam, Mathilakam, SN Puram, Kothaparambu... went past. I moved to the first row seat now – all set to get off. The bus had two passenger, two drivers and an attendant on board now! 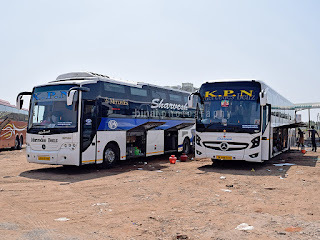 As the bus neared Kodungallur, the attendant came to call me – I requested them to drop me a little away from the bus station – the politely accepted my request. I was dropped outside the old Mogul Theatre in Kodungallur at 0931hrs – and the red monster rushed ahead for its last 40kms to Ernakulam, with one passenger and three crews on board! I was really excited to travel through the route in a multi-axle bus. End remarks: The bus, KA-01-AB-1361, had about 2.25lakh kms on the odo. I had travelled in the same bus twice earlier – once when the bus was fairly new, and once after the bus clocked about a lakh kms. This bus was on the Bangalore-Kodungallur route earlier – the bus still continues to visit Kodungallur every other day now. Like almost every other Kallada bus, this one too was kept in really good shape. There were occasional rattles, but that can be forgiven for the kind of roads this bus runs through. The end-to-end ride took 13h13m – for about 560kms. It’s surely on the higher side, but acceptable since the bus runs through about 75% two-lane roads, with a good ghat section thrown in. The arrival at Kodungallur was an hour late compared to the announced arrival time – we lost quite some time in the forest, and this delayed our arrival at Kozhikode – by now traffic built up, and kept delaying us. I loved the service – the crew were well behaved – spoke very politely to passengers and were accommodating of passenger requests. In short, I loved the ride – I am unlikely to take this route again, since a shorter option is available. But, I may take this bus again if I am heading to Kozhikode, or when I have lots of time. Will I take this service again: Its an excellent option for people looking at a convenient overnight connection between Bangalore and Kozhikode. I’ll surely take them if I need to travel on the route again.